I don’t know much about this classic Russian dish, but I can vouch they are sooooo good! In fact, it is one of my most favorite Russian foods of all time. I love it boiled, buttered, pan-fried or added in soups. According to some older Russians I met, back in Russia they made them in batches mostly during the winter months and freeze them outside. This usually involves the whole family, which to me, is very interesting. Imagine scheduling a day of pelmeni-making where every member of the family put in some effort in kneading the dough, filling in the meat mixture, sealing the dumplings, prepping them for freezing, etc. They probably make hundreds of them, enough to last for months! My first experience trying out pelmeni was actually store-bought. On my first week of arrival in the US, my husband took me to a Russian grocery store next to our family doctor’s clinic in West Sac. Aisle by aisle, he introduced me to some “foreign-looking” and “foreign-sounding” Russian foods. He picked some stuff that I might like, which include some sausages, bread, canned preserves, candies, condiments, Russian sodas, cookies, some cakes, and a big bag of frozen pelmeni (they looked to me at that time as “tiny flying saucers”). I was curious at first why he had to buy so many of them, but then later on when we got home and ate pelmeni for dinner, I understood. It was delicious, and like him, it became my favorite. This is my husband and I’s recipe, perfected according to our taste. We started making homemade pelmenis when I had my second child and during the time he was temporarily laid off from work. Because of our desire to save money and cook more at home, we researched recipes of our favorite dishes online, including Russian recipes. We tried them out, comparing ingredients and techniques from one web site to the other and experimented on what worked best. Since then, we stopped buying pelmenis from the store. We enjoyed making them from scratch at home for family’s consumption, sometimes sharing them with relatives and friends. We used to make them by hand which was a bit tedious at first. But when we finally bought a pelmeni mold, the job becomes easier and faster. 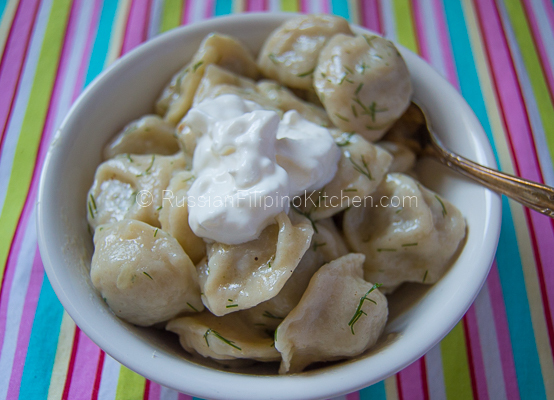 I hope you like this Russian pelmeni recipe. You can double or triple the recipe as desired if you are planning to make huge batches at a time. Don’t forget to share your feedback in the comment section below! 1. Place flour and salt in a large mixing bowl and mix. Create a well in the middle and add water, milk, sour cream, and egg. 2. Using your fingers, slowly incorporate the dry ingredients into the liquid ingredient until well-blended. Keep mixing until you form a dough. 3. Lightly flour a clean flat surface and transfer dough to knead. Use the heel of your hand to press and stretch the dough, fold it over and rotate 90 degrees. Repeat process until the dough is elastic and smooth. Shape into a round ball. 4. Put the dough back into the bowl, cover with kitchen towel to prevent from drying, and set aside for few minutes while you prep the meat filling. 1. Peel onion and slice into chunks. Smack garlic with the flat side of the knife to loosen the skin. Peel and cut the bottom ends. 2. Place in a food chopper and chop until fine. 3. In a medium mixing bowl, place the ground pork, ground beef, chopped onion and garlic, salt, and ground pepper. 4. Mix until all ingredients are combined thoroughly. 1. Spray pelmeni mold with cooking spray. This makes removing the dumplings from the mold a breeze (speaking from experience 🙂 ) 2. Cut off a portion of dough and form into a 3-inch ball, about the size of a tennis ball. 3. Place in a lightly floured surface and flatten using your palms. Roll it out using a floured rolling pin about 1/16th of an inch and until it’s wide enough to cover the pelmeni mold. 5. Carefully place flattened dough over the mold, making sure every hole is covered. 6. Scoop about 1 teaspoon of meat filling into each hole. 7. Prepare a second layer of dough (steps 2-3) and place on top of the filling. 8. Use a rolling pin to roll over the mold to seal pelmeni. Roll back and forth applying a firm pressure as you go. 9. 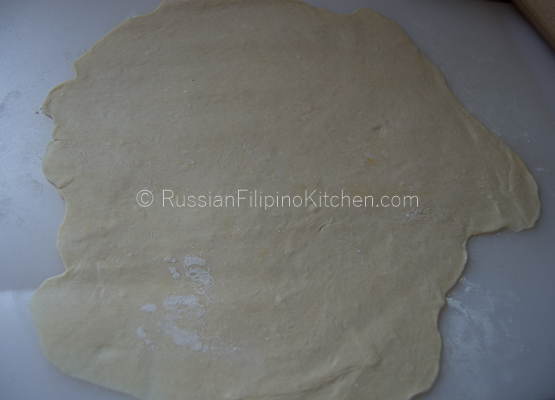 Remove scraps of dough from the sides and put back with the rest of the dough. 10. Turn pelmeni mold over and shake to remove the dumplings. Use your finger to gently push the ones that don’t come off easy. 11. If you see some pelmenis that aren’t properly sealed, simply pinch edges with your fingers to close. 12. Sprinkle flour on a baking sheet ( I also lined mine with aluminum foil) and arrange pelmeni in a single layer. Dust some more with a little bit flour and set aside. 13. Repeat steps 1-12 until you finish with the dough and filling. If you need to add another layer of dumplings for use right away or going to the freezer, simply place another sheet of aluminum foil over the first layer, sprinkle with flour and spread out the pelmenis. 14. Cut off portion of the dough and form into a ball (doesn’t matter how big) and flatten out using a rolling pin into a well-floured surface, about 1/16th of an inch thick. 15. Using a round cookie cutter or anything round shape that you can use like the mouth of a small cup to cut out circles. I recommend using one that’s 2-inch in diameter (I use the cap of Pam cooking spray) because larger than this you’ll end up with bigger pelmenis). 16. Stretch out the sides of the circle a little and place about a teaspoon of the meat filling in the center. 17. Using your fingers, fold in half towards the edges and pinch the sides to seal. 18. Hold both ends, gather together towards the center, then pinch. They should look like mini flying saucers :-). Repeat until you use up all the dough and meat filling. If you ran out of filling and you still have some dough left, don’t throw it away. Just form them into 1-inch balls, flatten slightly, and toss with the rest when cooking. 19. Do steps 12-13 to prepare pelmenis for cooking or freezing. When freezing, place the baking sheet with the pelmenis inside the freezer until the dumplings are frozen, then transfer to plastic bags, seal and place back in the freezer. It is good for several months. 1. Fill a 5-quart cooking pot with cold water about ¾ full and add a teaspoon of salt (use a gallon of water per 2 pounds of pelmeni). Cover, turn stove on to high, and bring pot to a rolling boil (that is, till you see lots of bubbles). Note: In my experience, adding salt to water and covering the pot makes the water boil much faster. 2. Add pelmeni slowly into the pot, careful not to splatter the boiling water, then stir. The dumplings will settle to the bottom at first. Cover the pot and bring to a boil again. If you are adding frozen pelmeni, you will notice it will take much longer. 3. When it starts boiling again, remove the cover and lower the heat slightly stirring the pot every once in a while. Cook for 2-3 minutes until you see all the pelmenis float to the surface. This lets you know they’re ready. 4. Use a colander to drain the water, transfer back to the pot, and add about 2 tablespoon butter, 1/8 tsp ground pepper, and 1 tbsp chopped fresh dill. Stir to mix. 5. Ladle into a plate or bowl and serve with a dollop of sour cream. Enjoy! Love the mold! My husband is Russian on his father’s side. Gonna have to give this a try. Thank you Valentina! I appreciate your nice comments! Hi, Mia! I love your blog with all these fusion recipe! Some dishes make me feel at home! I’m not russian but half of my family is Romanian and they have a lot of dishes in comun. Another thing that I love when I’m on your blog is that I can see how different countries have different variation in basically the same recipe! In Romania make these thing a little ‘bit more big and they call them Coltunasi. In Italy( I’m from Italy) we make them very tiny and we call them Tortellini. But I will try your recipe for all my family! It seems so delicious! hi mia its very nice to see your recipe.. look great iwill try to make a food like this.. Thanks for stopping by! Hope it turns out great.